Is McDonald's a Safe Haven Stock in Today's Volatile Market? Like dividends but worried about the market? Take a look at the "new" Mickey D's. For those worried about current market volatility but who want to stay invested, what's a good defensive stock? Consumer staples have traditionally been a good option, although I'd argue that big-name brand power may be waning due to competition from private labels, making consumer packaged goods standbys a less enticing option. 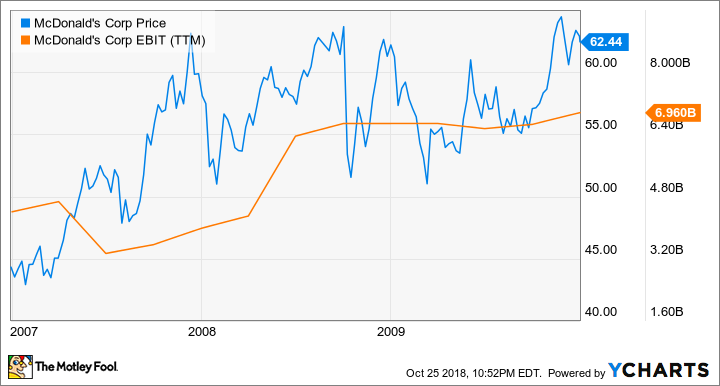 But one thing's for sure: In a recession, people will still need to eat, and they'll likely turn toward something that's filling and low-cost, like a McDonald's (NYSE:MCD) Happy Meal. In addition, McDonald's just reported a strong quarter and is midway through a turnaround plan from new(-ish) CEO Steve Easterbrook. While bonds still don't yield very much these days, those looking for income and stability in a volatile environment may want to give McDonald's and its 2.6% dividend yield a closer look. Is McDonald's the perfect recession stock? Image source: Getty Images. McDonald's is also making its business model even less risky, as it's in the middle of a multiyear refranchising program. Currently McDonald's owns only around 7% of its restaurants, with the rest owned by franchisees who pay McDonald's sales royalties and rent. Still, management isn't satisfied, outlining a goal to get that figure down to 5% in the near future. Although this refranchising has caused McDonald's top line to decrease, it has actually increased profits while also lowering operating costs. Last quarter, revenue fell 5% in constant currency, but net income actually grew 17% in constant currency, adjusting for last year's sale of its Chinese restaurants to a franchisee. Earnings per share grew an even larger 22% in constant currency thanks to a 4% reduction in outstanding shares from share repurchases. Not only is McDonald's becoming a more capital-light business, it's also in the middle of a multiyear technological transformation effort. CEO Steve Easterbrook came from the company's United Kingdom segment, taking many innovations that have worked internationally and applying them to the larger but underperforming U.S. segment. His new "Experience the Future" initiative is built upon various tech-enabled upgrades, including digital menu boards, self-serve ordering kiosks, mobile order and pickup, and enhanced delivery options through the McDonalds app. As part of the initiative, McDonald's is remodeling 1,000 out of its 14,000 U.S. restaurants every quarter. This is important for two reasons. One, by making the restaurants less "human" intensive, McDonald's can save on labor costs, which are going up across the industry. Second, these innovations have already been implemented overseas, where McDonald's has experienced an uptick in sales growth compared with the U.S. due to the better customer experience. Last quarter, international lead markets same-store sales grew 5.4%, while foundational international markets grew 6%, and high growth international markets grew 4.6%. These comp figures were all higher than those for the U.S., which grew comparable sales 2.4%. After positive results in the U.K., Japan, the Netherlands, and Australia last quarter, management stated that newly remodeled U.S. restaurants are now experiencing sales uplifts as well, as expected -- another good sign. In addition, McDonald's has a competitive advantage in delivery. That's because it has so many restaurants (roughly 37,000), which are often far closer to the customer than most competitors. As of the last quarter, the company had rolled out its delivery capabilities to an impressive 15,000 restaurants, in partnership with Uber Eats. While McDonald's trades at a not-so-cheap 23 times forward earnings estimates, it's not exactly expensive either, when you consider the mid-single-digit comp sales, operating leverage, and huge cash returns. The company also just raised its dividend by 15% and repurchased 4% of its shares over the past year. That new 2.6% dividend and 4% repurchase add up to a decent return, especially if Easterbrook can reignite better growth in the U.S. If you're currently worried about volatile market movements and cyclical stocks, you could do far worse than park your money under the Golden Arches.